Run flat tyres are becoming increasingly more commonplace and the number of vehicles fitted with this type of technology is set to grow. Self supporting run flat tyres to give the product its correct terminology, have specially designed sidewalls designed to provide a run on period following the deflation of a tyre. Different issues come into play when run flat tyres are fitted to a vehicle that is towing a caravan or trailer says Protyre, the UK’s leading independent tyre dealer network. In their normal, inflated condition run flat tyres on a vehicle with a trailer/caravan in tow can be treated in the same way as a standard pneumatic tyre. However, a deflated run flat tyre is designed to cope with the demands of a solo vehicle, the additional mass of a caravan/trailer subjects the tyre to higher stress levels and impacts on the tyre’s in-built torsional and lateral stability. The consequences of this is that even travelling at a restricted speed of 50 mph for 50 miles as recommended by most manufactures of this type of tyre, the additional flexibility of the deflated run flat tyre may negatively affect the stability of the car/caravan combination. To avoid this potential hazard, Protyre recommends that the distance travelled and maximum speed when driving a vehicle with a deflated run flat tyres should be reduced. As the vehicle itself has an influence on a tyre’s performance drivers should refer to the vehicle manufacturer’s handbook for further information. Protyre also makes the general point that run flat tyres should only be fitted to a vehicle that has been specifically designed to accept this technically advanced tyre and has a tyre pressure monitoring system fitted that provides the driver with an audible or visual warning of a deflating tyre. 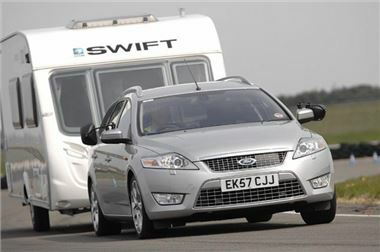 As yet no caravan or trailer is fitted with pressure monitoring system and so should not be fitted with run flat tyres. Find your local Protyre outlet visit www.Protyre.co.uk. Or call in to your local Protyre centre for a free tyre safety check.